20 years, it's a long time Dave. While fairly streamlined in design and mimicking early arcade classics such as Space Invaders, Galaxian and Galaga. Space Dave! is a retro inspired arcade title that, if you’re into that kind of thing, will have you lamenting the fact that you don’t own an Arcade stick yet. Space Dave! finds Dave, or one of his seven friends, defending their homestead and attempting to thwart an alien invasion by shooting upward at a series of weird and wonderful creatures, all of whom appear to have the ability to fly in formation down to a fine art. 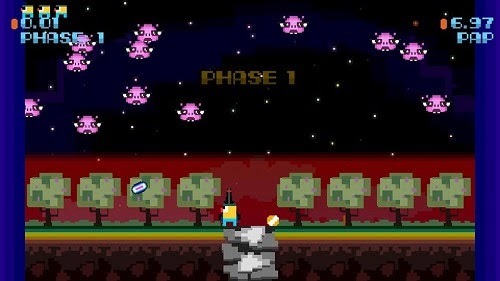 The main game falls into a simple loop; jump and shoot upward while attempting to clear all of the aliens on the screen, when all of the aliens are destroyed the next wave will begin. Occasionally an alien will make a suicidal slow plummet to the ground; failure to stop them will result in a rectangular hole of lava being dug into the ground. 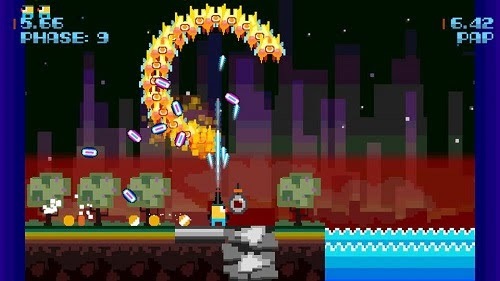 Falling in this lava or getting hit by an alien or any of its projectiles will kill Dave. 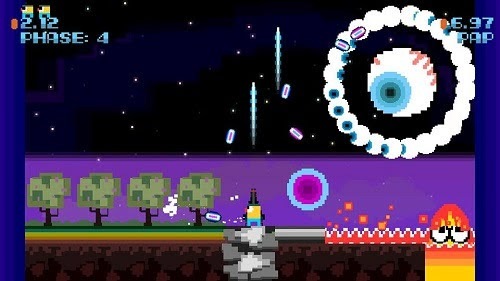 Space bricks can also be sniped down from passing UFO’s, rushing past in the heat of battle. 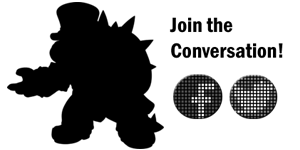 Reminiscent of Super Mario’s POW bricks, throwing one of these will send a tractor beam into the air, assimilating any of the enemies unlucky enough to be caught in its path and forcing them to continue their fight by your side. A well-placed space brick coupled with a power-up or two may find you with an army of unstoppable firepower at your disposal, defeating waves of enemies in a matter of seconds. After several waves you will fight an end of stage boss; besting this oversized creature will move you to the next one of the games 8 stages. Each game grants the player with 3 lives, lose all of these and its back to the beginning for another attempt. The addition of a second player into the game mixes up play slightly, allowing you to emit a super burst attack when standing in close proximity to one another. 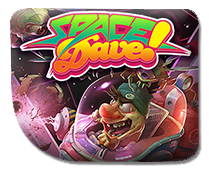 While simple in its premise, Space Dave! is rather addictive. With gameplay sessions not lasting long and the game can be frustratingly difficult, especially in its hardest setting. The Switch’s portable abilities make it the perfect platform for a bit of pick up and play commuter action. There are online Leaderboards for both single and the games co-operative 2 player mode, across all of the 3 games difficulty modes. For the completionist, the game also contains 15 in-game achievements, with the ability to track progress from an option in the games title screen. In true arcade fashion the game doesn’t contain any sort of tutorial, instead opting for a “how to play” screen in the menu. Considering that the game only contains two buttons and employs unaltered mechanics that have been used time and time again since the birth of video gaming, this really is a nonissue. Imitation may be the sincerest form of flattery but with so many independent titles attempting to push the envelope, not only trying to rekindle that feeling of nostalgia but also to build upon it, working to create a new experiences instead of just reminding the player of days gone by, Space Dave! may just not do enough for some. It is a solid title (and if you’re into the look and feel of early Arcade or Commodore 64 classic graphics then this one is definitely for you) but any screams of “buy me now!” may possibly fall on deaf ears when it attempts to reach out to anyone not born in the 80’s. To those that are, Space Dave! will have you yearning for a simpler time, back to the days when rows upon rows of machines adorned your dimly lit local arcade. When waiting your turn meant lining up your coin on the bezel of a machines ultra bright CRT monitor (while trying to forget the blazing rows that ensued when someone tried to jump the queue). The nostalgic feeling is strong for those of a certain age but unfortunately Space Dave’s completely retro aesthetic and unaltered gameplay mechanics may only appeal to those who genuinely miss sitting down at a cocktail cab for a round or two of tempest or Dig Dug, or at least those old enough to remember playing through the loading screens of early nineties Namco Playstation games. + Emulates the feel of 80's arcade classics. + Addictive “one more go” gameplay. - Online Leaderboards are slow to navigate. Labels: Nintendo Play, Nintendo Switch, Review, Space Dave!